Marine Corps Combat Pistol Program - USA Patriotism! Every Marine is a rifleman. This is evident in every photo of a Marine donning the service alpha uniform, courtesy of the shimmering marksmanship badge over their left breast pocket. Oftentimes this rifle marksmanship badge is accompanied by another badge, indicating the Marine is qualified with the Beretta M9 service pistol. 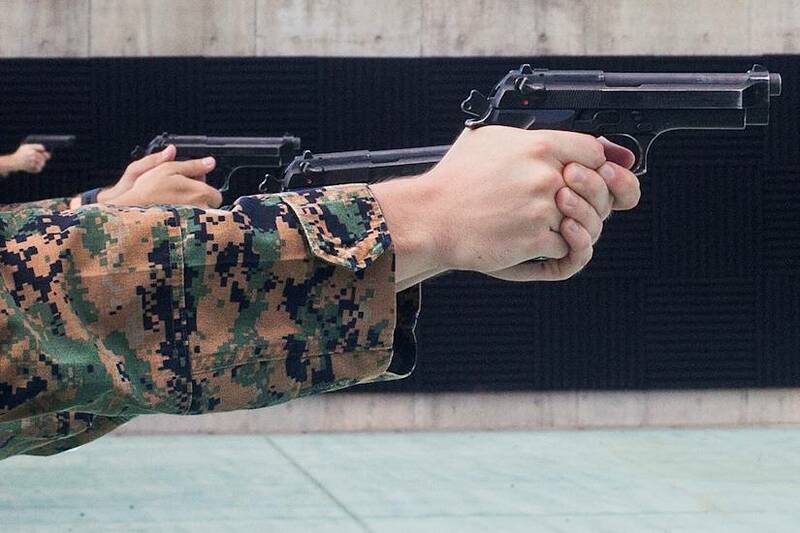 The pistol qualification is one that is not required by every Marine; instead, only certain military occupational specialties, officers and staff non-commissioned officers require annual qualification on the service pistol. 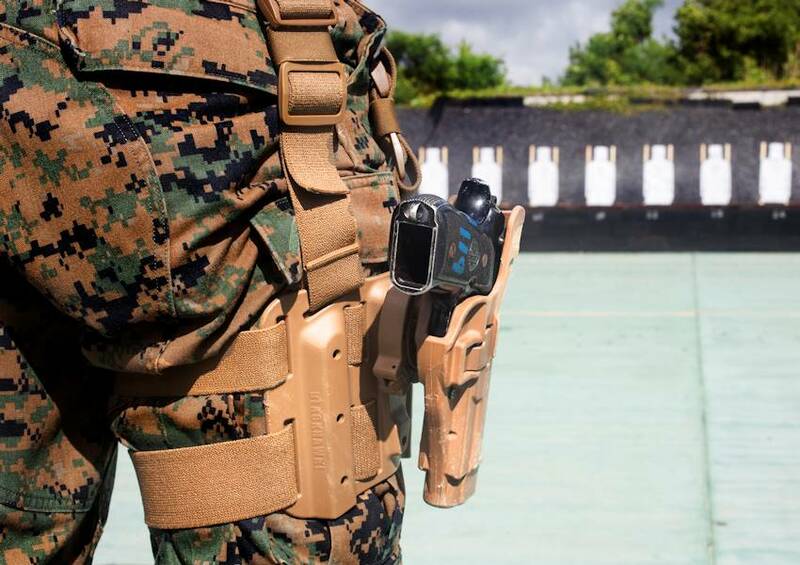 In order to ensure these Marines are properly trained with the weapon, the Marine Corps implemented the Combat Pistol Program (CPP). The CPP was introduced in 2012 after the Corps decided it needed to revamp its pistol qualification, the entry level pistol program (ELP). The ELP course of fire was less combat-oriented and was more inclined to promote fundamentals and accuracy. While these are essential aspects of pistol marksmanship that challenge the shooter to maintain pinpoint accuracy, the ELP lacked sufficient tactical drills to prepare Marines to draw their weapon and engage a target. Thus, the CPP was introduced. One of the hallmarks of the CPP is how the first two stages of qualification start with the weapon in the holster, requiring the Marine to present the weapon and engage the target in one motion – this gives the training a more combat-oriented and tactical approach. While the CPP is known for its tactical application, the fundamentals and coaching are not abandoned. Gunnery Sgt. Jarod Vedsted, the lead instructor with 3rd LE Bn, III MIG and former instructor of the protective services course, states “we’re in tandem with them” when asked how the CPP correlates with civilian counterparts in the sense of basic pistol training. 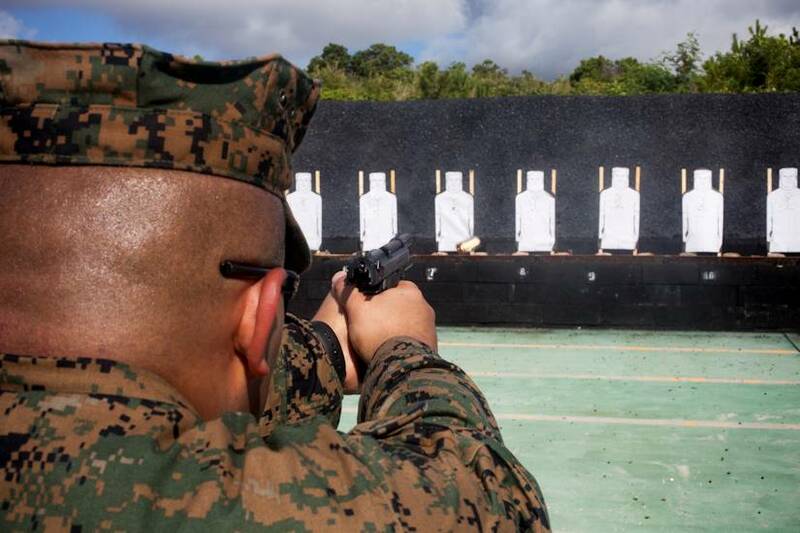 Tables one through five of the CPP teach basic pistol skills and marksmanship, but any further pistol training does not exist in formal standards in the Marine Corps. The CPP is just one of the ways the Marine Corps has made efforts to make its training more realistic and combat-oriented to better prepare Marines. “Programs evolve as we learn new things about marksmanship,” says Schuster. Marines are supporters of the CPP, and five years after its official release, it still receives praise among marksmanship instructors. “I prefer it,” said Schuster, “The CPP definitely introduced a more tactical mindset on the pistol range.” Wherever the Marksmanship Program Management Section goes next, Marines are likely to be enthusiastic and motivated to send rounds down range.